336 Annette Street, north-west corner of Laws and Annette (1888-1936). The house, christened “Oaklands” was one of if not the grandest house in the Junction. Originally built for lumber merchant John Stewart in 1888. In 1906, R.L. 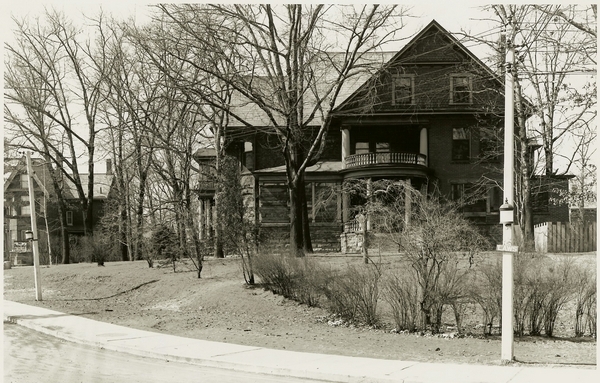 McCormack purchased the home and commissioned extensive renovations. James Ellis was commissioned for this job. Notable additions were huge Edwardian porches which added to the home’s grandeur. The mansion had ten bedrooms, a tennis court, stables, a library, two living rooms, servants’ quarters and a morning room with floor to ceiling mirrors on marble bases. The property was later sold to a Jewish philanthropic organization for a orphanage/boy’s home. The home eventually went bankrupt and a Mr. Richardson purchased the building and demolished it replacing it with the buildings that now stand on this site.